Item # 302321 Stash Points: 2,499 (?) This is the number of points you get in The Zumiez Stash for purchasing this item. Stash points are redeemable for exclusive rewards only available to Zumiez Stash members. To redeem your points check out the rewards catalog on thestash.zumiez.com. Grab a t-shirt for your little one that is just as worthy of soccer practice, as it is band practice, with the Adidas Boys California Blue T-Shirt. Tagless and lightweight, this bright blue shirt is as fashionable as it is breathable, to keep your little one extremely comfortable, no matter the activity. Finished with an embroidered Trefoil logo at the left chest and traditional three-stripe detailing sewn into the sleeves, this shirt is definitely true to adidas truly iconic style. 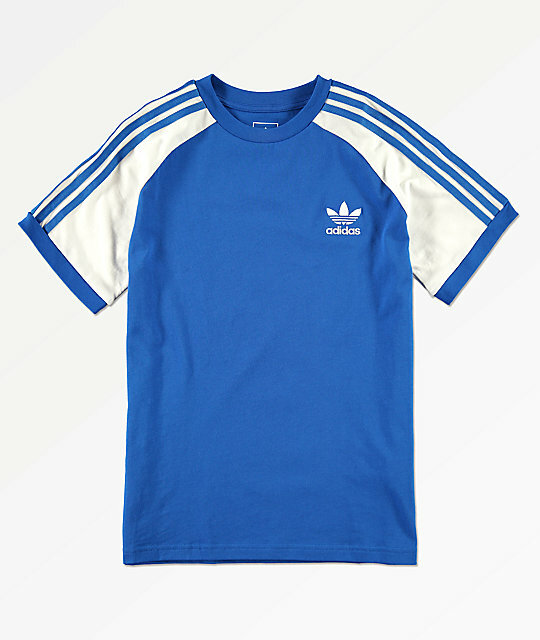 Boys California Blue T-Shirt from adidas.